Recently I got thinking about Flappy Bird scores, and noted that they should be similar to cricket scores in the way they're distributed. Translating the problem to cricket, the question is, "What is the relationship between a batsman's highest score, his average, and the number of innings he's batted in?" A follow-up question is how well such a formula predicts, say, the average based on the innings and highest score. I expected there to be quite a lot of scatter (assessing a batsman on just one innings! ), but the correlation ended up being pretty decent. This isn't a particularly useful correlation, but I found it fun to play with. 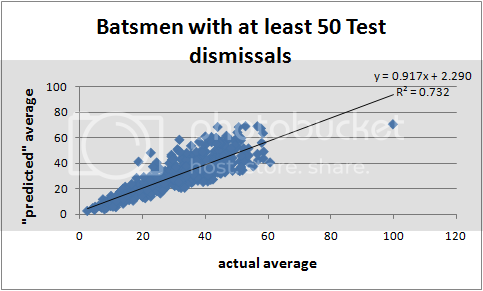 Given the average, the probability that a batsman makes a score less than x is roughly (1 - exp(-x/avg)). Treating each innings as independent of the others, the probability that all N of a batsman's innings are less than x is therefore (1 - exp(-x/avg))N.
which is the basic relation between highest score, average, and number of innings batted. HS = -avg * ln(1 - 0.51/N). avg = -HS / ln(1 - 0.51/N). I doubt I'll ever use this formula, but Perhaps the most amusing individual result is Shane Warne: based on his average and innings batted, his "predicted" high score is... 98! So he didn't quite deserve that hundred after all. Full table, straight off Statsguru – I was so lazy that I didn't even turn off the ICC game.